Senterprise Fidelity Greta 2 was the vendors’ first title winner at Skipton by the CRV sire, Delta Fidelity, currently responsible for some productive milkers on the Houseman holding, the 2013 Craven Cattle Marts Farmers of the Year. 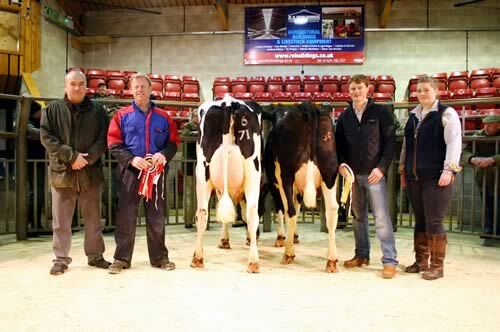 Pictured with the opening February Craven Dairy Auction principles are, from left, judge Shaun Sowray, champion Mark Houseman, reserve champion James Swires and Megan Thomas, of sponsors G Shepherd Animal Health. Three weeks calved and giving 31 litres, the victor, out of Senterprise Potter Greta, sold for £2,000 to Red Rose dairy farmers and regular Skipton buyers, Alf and Andrew Townsend, of Southfield, Burnley. While there was a small entry of just eight dairy cows, the vendors who did appear were well supported at the ringside, with all newly calven heifers averaging a respectable £1,671 per head. However, a number of potential buyers left empty handed. Making his Craven Dairy Auction debut, John Robinson, from Harmby, near Leyburn, was well rewarded when achieving the day’s second top price of £1,980 with a home-bred red and white newly calven pedigree heifer giving 30kg. The buyer was Wick Williams, of Nantwich. The second and third prize newly calven heifers both came from the commercial herd of Tony Swires at Town End Farm, Stainburn, and were shown by his son James. The eight days calved runner-up, also reserve champion, is by the Semex bull, Regancrest Ilar, and came to market giving 28 litres. Both prizewinners joined show judge Shaun Sowray in Bishop Thornton at £1,920 each. The first prize newly calven cow, a third calver from Beamsley’s JN&J Rennard made £1,050 when joining Frank Wrathall in Gisburn. The Housemans also ran rife in the same day’s weekly rearing calf sale when presenting the two top-priced youngsters, both British Blue-crosses – a bull calf at £490 and a heifer calf at £400. For good measure, they also headed the native breed prices with an Aberdeen Angus heifer calf that made £295. JC&DJ Marshall, of West End, also chipped in with a trio of top-prices – a Limousin-cross bull calf at £310, a same way bred heifer calf at £200 and the pick of the black and whites, a bull calf at £130. With 45 calves forward, Continentals averaged £358 per head, native breeds £196 and black and whites £88. “Both rearing calves and dairy cattle, although slightly short of numbers, were all keenly contested and trade would be in front of many vendors’ expectations on the day,” commented the mart’s livestock sales manager Ted Ogden.